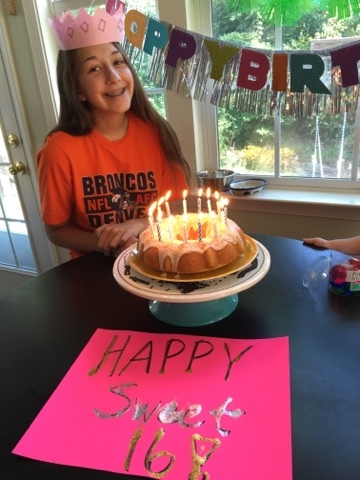 The tradition of birthday mornings began in this house with this girl. Daughter number one. We moved in to our home June 2007. Leah's August birthday was the very first birthday we celebrated in our new home. I quit my job and for the first time became a stay at home mother. Knowing the specialness of birthdays and my being home more the tradition began to take off. We have had our moments of missing those morning muffins, babies have a way of changing plans, but I do love this tradition. I woke up early to hang banners, balloons, and streamers. It was not my best work as I didn't quite get up early enough. While birthday muffins are the standard for our children this girl needed something a bit more. 16 is a big birthday so I made a coffee cake. A beautiful lemon coffee cake for our sunny 16 year old. The littles were so excited to help in the tradition. They found balloons and streamers to drape over furniture. It was such fun for them. Then the anticipation of waiting for big sister to see the surprise. So endearing. A special birthday deserved a fancy cake. 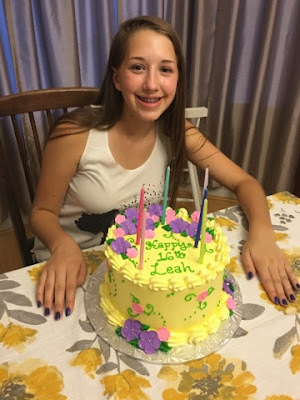 Leah chose this beautiful cake at the favorite local bakery. She invited a few friends over and had a perfect low key teen party. We rambunctiously sang happy birthday to her as she made her wish on those candles. The cake was almost to beautiful to eat....that didn't stop us! It was delicious! We celebrated our lovely girl all weekend long.